IAM representatives at the UTC shareholder meeting included (left to right) Tony Walter, Vice President, Local 743, David White, Assistant Director, Strategic Resources Dept. 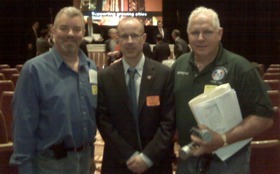 and Mark Hebert, President of Local 743. IAM representatives attended the annual shareholder meeting for United Technologies Corporation (UTC) in Indianapolis, IN, this week and actively supported a proposal to give shareholders a say on excessive executive compensation at the aerospace giant. The pay and accountability proposal, submitted by the AFL-CIO Reserve Fund, drew support from more than 40 percent of all shareholders, reflecting growing concern that executive pay does not equal executive performance at UTC. Pay for UTC CEO Louis Chenevert in 2009 was $20.5 million, according to proxy material provided by the company. There is also increasing public support for improved transparency and accountability of these executive pay programs. The AFL-CIO/IAM proposal calls for an advisory vote to establish an annual referendum process for UTC shareholders to vote on executive compensation for the top five highly-paid executive officers.